Like so many peopele—a majority of voters, no doubt—I was distressed by Donald Trump’s winning the presidential election. I anticipated that his presidency would be a disaster for the country. Alas, I was mistaken. It promises to be an utter catastrophe. 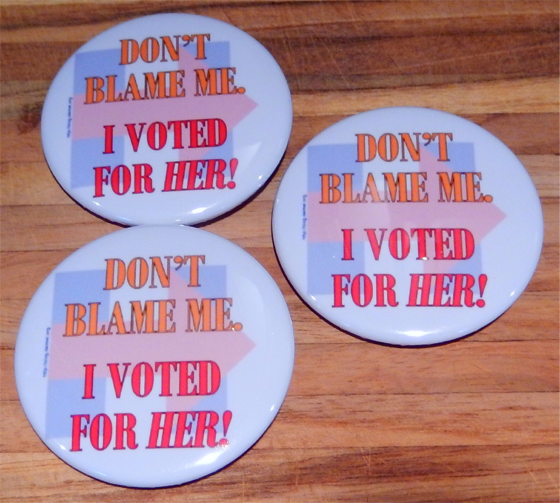 Almost immediately, I thought of creating buttons with the slogan “Don’t blame me. 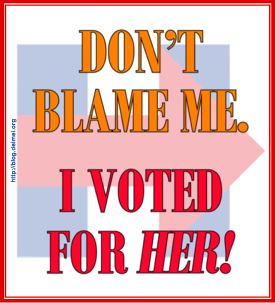 I voted for her!” I waited several months to order buttons, however, and finally did so when I could stand our man-child president no longer. I have decided to wear one of my buttons every day Trump is in office. I’ve received many comments on my button. No one has asked me for one, however, or tried to argue with the sentiment expressed thereon. Nevertheless, I persist. The buttons shown in the photograph below are 2¼" in diameter. It isn’t clear whether I should have more made, but if you would like to purchase one or more, please send me e-mail from here. I am not seeking to make a profit, but I would like to cover as much of my cost as possible. If I lose money on this project, I will consider that it was done for a good cause. I love the buttons!! Amazing work!! Hahahha Why hasn't anyone ordered any yet!! A lot people didn't vote for Trump and don't like him!! Emailing you right now for an order! !